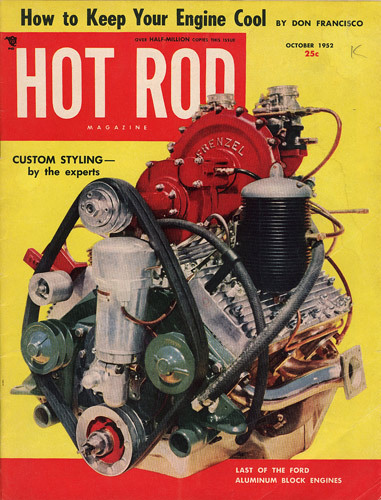 That’s the October, 1952 cover of Hot Rod Magazine… It features the FoMoCo produced aluminum block flathead. According to the article inside, ten of these blocks were produced in 1940 for experimental use in small airplanes. 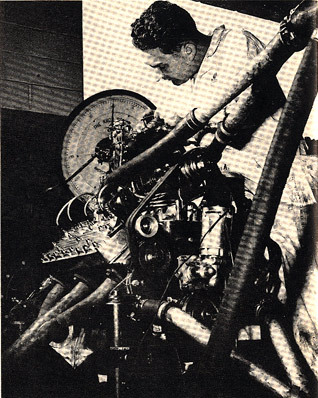 After being subjected to some serious dyno time, it was found that a thermal condition (aluminum expands and retracts faster than steel) caused the steel cylinder sleeves to buckle near the top of the cylinder bore, resulting in severe scuffing of the pistons. However, in the Hot Rod Magazine article the new owner of this block thinks he has found the answer – larger cast iron sleeves. We don’t really know if his solution worked as advertised, but we do know that this article inspired many a search through the years. If this guy had found one of the ten aluminum blocks out there, why couldn’t the other nine be found as well? Rumor has it that more were found in recent years. While no single person has stepped up publicly to lay claim to this feat, it has been reported that there are four or five of these blocks sitting in a shop in Southern California. That puts our count to around five or six found and four more left to be discovered? Sure, an aluminum flathead block can be bought new these days… but where is the fun in that? 28 Comments on the H.A.M.B.